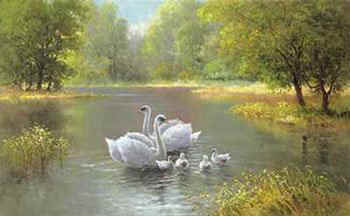 On a peaceful tranquil lake there lived families of elegant swans. Every morning and every evening they echo their beautiful songs. They were led and taught by the Grandfather who taught them the old ways. In the afternoon, they swam and bathed and bathed in the sun’s golden rays. For many years this daily ritual continued until one day, the Grandfather died. Immediately there was the outpouring of grief, darkness and confusion descended over the lake. They all cried. The darkness deepened, the confusion got worse. They felt utterly lost. There was a chill in the air and for the first time a morning frost. At the height of the darkness, a light shone in the middle of the lake. The swans were very afraid. Then out of the light came a most beautiful swan with golden wings. The darkness suddenly lifted. The lake was bathed in golden rings. The swan spoke to them in a voice they knew. “I have not left you”. My words are true. The Grandfather had returned. He taught them new ways. He stayed with them for a while until the elders understood the new ways. Then the mystic light appeared again. The Golden swan entered into this glorious light. The darkness did not return. The tranquil lake was once again a vibrant sight. The Grandfather had never really left. He continued to watch over them from above. Every morning and every evening, the swans echoed their beautiful songs of love. The lake was once more peaceful and tranquil. The swans were happy.